As a business owner, you need to find simple but effective solutions to attract and retain customers, build your brand and market effectively. Finding solutions that are very easy to implement without any unnecessary time or expenses are even better. Well, Naturizzata Water can help you with all of these aspects. Do you own a restaurant, hotel, spa, gym, retail business or office? Naturizzata Water makes it easy to purchase one of our commercial water filtration systems in Canada. Our water filtration units come in variety of styles including counter tops and water tower. Our water purification systems are Italian-designed and created by an experienced team of experts who have spent 30 years perfecting the technology. 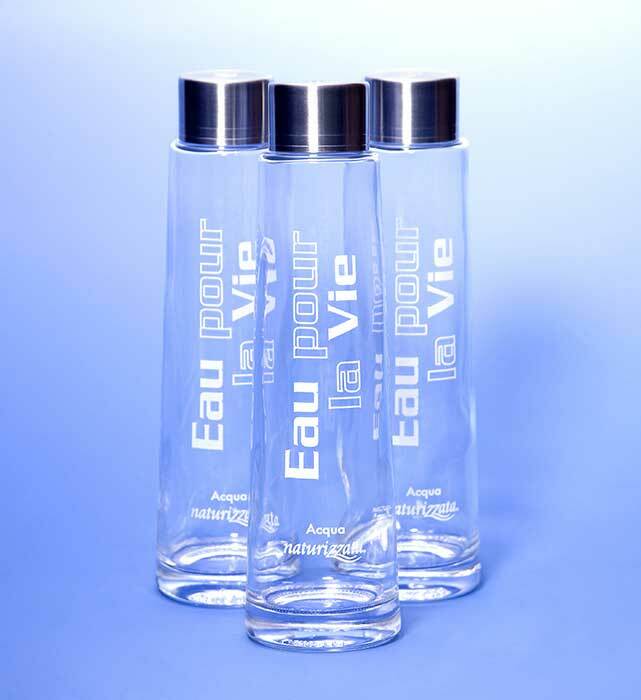 The result is pure, filtered water containing no impurities that tastes better than any other water you have ever tried. One of the best aspects of purchasing one of our innovative water filtration and purification systems is the fact that the operation is completely turn-key. You don’t need to know anything about water filtration or purification to get started. Our goal is to make the process as simple and enjoyable as possible. You can start by contacting us or fill out an online form to discuss your particular needs. Our knowledgeable staff can help you choose the appropriate water filtration model for your company. Another popular option is to contact our design experts, who can design branded logo glass bottles. Reusable and eco-friendly, the elegant glass bottles will show your customers that you care about the environment. If you decide to purchase one of our innovative water filtration systems, you can leave everything to us. Our team of experts are available to answer any possible questions you may have and explain all of the benefits of owning one of our unique and fabulous water systems. To get started, all you require is sufficient space for the system (compact and larger models are available), a water connection, a water source and electricity (110-volt outlet with 2 plugs within 3 feet of the equipment). You and your staff don’t require any special equipment or technical knowledge to get started. Our experienced technicians will handle every aspect of the process. Once your system is installed, a technician will explain how the system works. You’re then ready to start serving the best tasting filtered sparkling or still water to your employees and customers! You may be thinking this all sounds too good to be true because you also need to maintain the Naturizzata water filtration system you have purchased. Well, we also make this process as simple as possible. In fact, you don’t have to do a thing to maintain the equipment. Naturizzata Water will handle all service and maintenance of your system. This includes on-site visits and a full maintenance and service program. Naturizzata Water is proud to offer the Water4 Life Program. We have partnered with many other companies to design a program that is beneficial to the environment, your health and your pocketbook. By showing your VIP card, you and your guests will be served delicious Naturizzata still and sparkling water at no charge while you dine. Members can also take advantage of our complimentary refilling stations.